An unexpected vacancy in one of my upstairs units prompted me to consider what more I could do with the space. 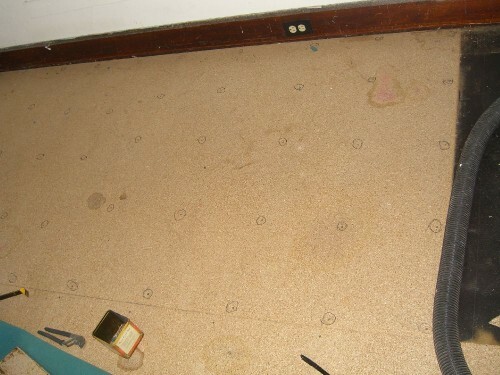 The carpet was always more functional than anything else, so I decided to see what the floorboards underneath looked like and go from there. Curiosity may have killed the cat, but here it just sent me down a rabbit hole of hard work, muffled curses, and occasional laughter at yet another roadblock. (Spoiler: it all ends well.) 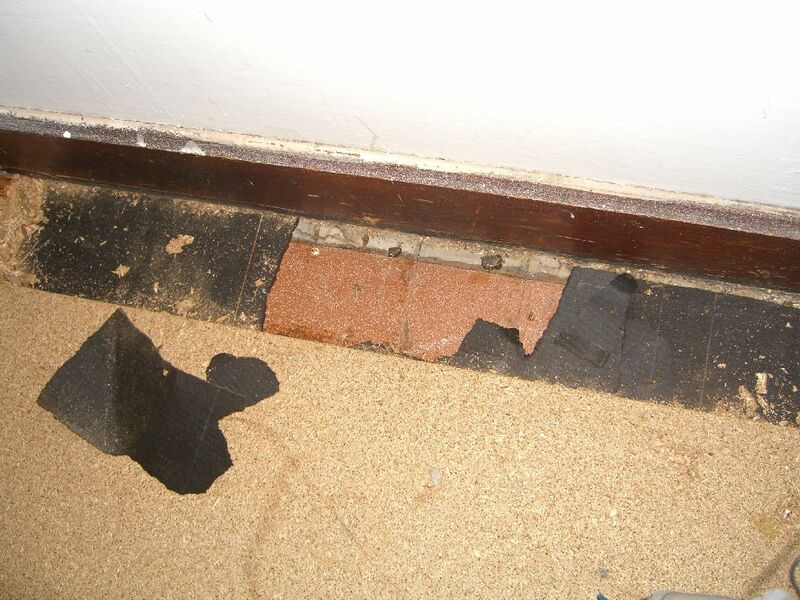 The previous owner’s recollection of what was under the carpet he’d laid was ‘the heaviest padding [he] could get’. Marvelous, I thought. 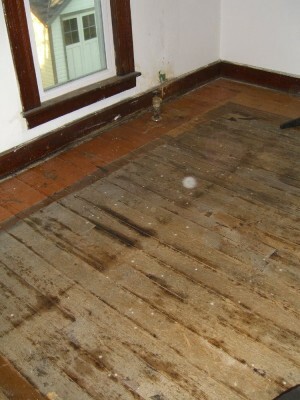 Pull up the carpet and the padding, and the floorboards will be mine! have to frustrate every [person] working on the project… accept no substitutes. 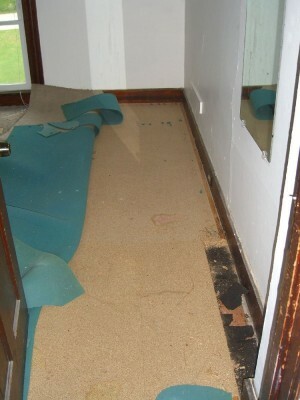 I debated stopping the project and shopping for new carpet instead, but decided to expose at least a little bit of the old floor. If it the original boards looked to be in good condition, it was probably worth proceeding. If there was laminate, or deeply scarred boards, or ugly knotted pine or something else, then carpet it would be. So to recap: pull up the carpet, roll and remove; stuff 120+ square feet of padding into trash bags; pull a lot of staples from the particle board; pull all the nails from the boards; then lift and remove all these heavy boards (cutting up some water-damaged ones for disposal). 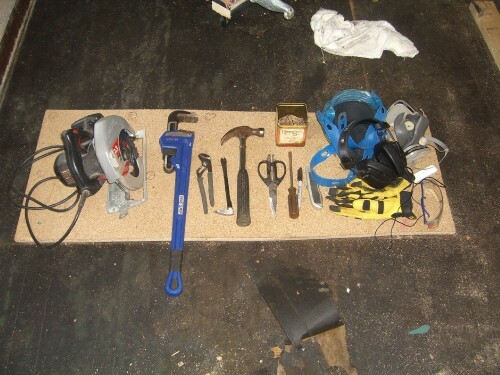 No, I don’t think I have too many tools, thankyouverymuch. All the effort was, I think, well worth… the… effort. 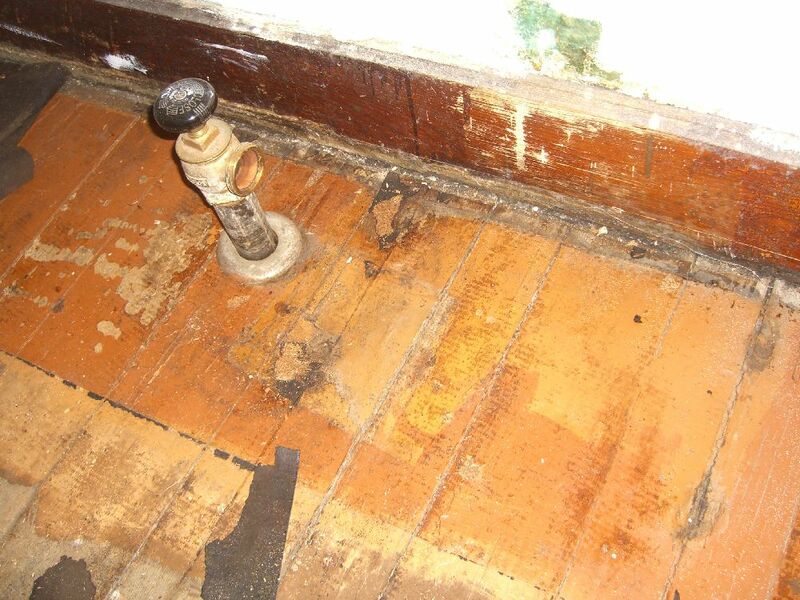 Aside from this one cracked board – the result of a window being left open during one or more storms years ago and water soaking into the particle board underneath a heavy cast-iron radiator – the old floorboards are in pretty good shape. The floor – and quite likely the floors in the other upstairs rooms – were partly painted, a common decorating approach a century ago. A large area rug covered the center of the room and the floorboards were only painted around the rug. In this case, the room was redecorated at least once – a slightly different sized rug was used and a new color painted over most of the existing ‘frame’. You can still see the earlier brown color inside the orange that was used later. The boards in the center were never finished in any way and have just grayed with time – they look to have interesting grain, and with their age they’ll be nice and hard regardless of the type of wood used. This’ll wind up looking good. … and no doubt much more. I will take some pictures and write some tales, I promise. Just don’t ask when. Did I do things? I like to think I’ve been doing things that don’t involve betraying my childhood friend and then dying in England (true story; just not mine), but I can’t say for sure. Such nice weather today – let me get some things posted for my actual job, and then go paint something. But I was either in Hamlet rehearsals or sick over the weekend, and thus wasn’t really a part of them. And one of these days I’ll tell you all about it. Been moving things around in anticipation of tomorrow’s (today’s) garage sale. If you’re in town, come over and take this stuff. Please. After that’s gone, all I need is to figure out where I’m putting the shed out back (still… yes… I know) and then I can move the rest of the things I don’t need in the house out of the house. And THEN I can get some work done.